Nella foto: Lorenzo Di Sante nel ruolo di un soldato del Terzo Reich. Compra il DVD "Il Sangue dei Limmari"
Sono in America e voglio comprare il DVD "Il Sangue Dei Limmari." Signora, please excuse my writing in English, but my Italien is not good enought. 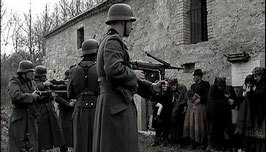 I want to aks you if we can use the above historical image for our project "Gedenkorte Europa", an internet guide to places of German war crimes and resistance, beginning with Italy and France. As our little organisation Studienkreis deutscher Widerstand 1933-1945 has little money and we do our work voluntarily we can not buy the copyright of images. Of course we will name the origine and make a link to your jhomepage.